The ancient Spartans believed in religion and the gods like the majority of the ancient Greek states. Therefore the religion of Sparta was Polytheism, which means that the Spartans believed in not just one god, buy many gods. The primary gods in Ancient Greece at the time were of course the Olympians lead by the mighty Zeus who was connected to all the Olympian gods in some way, and the Spartans followed the belief in the powerful Olympians. The belief in the gods was as strong in Sparta as in any ancient Greek state. In many cases its reported that other Greek states infact mocked the Spartans fastidious praise of the Gods, as the Spartans believed the gods were to be obeyed and respected without question. 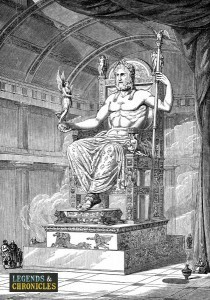 The ancient Greek gods themselves were of course fitted with each state of the Greek empire and groups of people in a unique way, and the gods would serve different purposes for different states and Sparta was no different on this matter. Aphrodite for example, the goddess of love, was in ancient Sparta considered and worshipped as a warrior, which complimented perfectly the Spartan attitudes to not only fighting but also their equality towards women. The Spartans like many Greek states would have favourite gods, the ones who merged most effortlessly with their lifestyle, their mantra and their ethics. With the military focused Spartans their favourites gods were of course the war focused ones, likes Ares and Apollo, although as we mention later, the Spartan were eager to appease all the gods. Sparta while being a military state, also enjoyed the benefits of festivals, and some of their major festivals were intrinsically tied to their religious beliefs. The Hyakinthia for example was a major festival in the Spartan calendar that lasted for three days, and celebrated the god Apollo and Hyakinthos, hence the name of this much loved Spartan festival. It is also reported that the reason for the 300 soldiers that marched with Leonidas was actually that number due to the Karneia festival that was ongoing at the time. Leonidas and the Spartans did not want to upset the gods, and therefore did no interrupt the festival, marching with only the men available at the time. In ancient Sparta, there were no priest persay, in many ways however the true priests of the Spartan state were the kings themselves. The Spartans considered their kings to be priests of Zeus himself, tied intrinsically to the primary Olympian, and they would partake in many religious practises, including the overseeing of note taking of any signs from the gods. The kings would also look to the gods as explanations for certain events, both good and bad. A King of Sparta could for example look to blame the favour of the gods on a lost battle, or even attribute a mistake that was more rooted in human behaviour to the gods. It is safe to acknowledge that in ancient Greece the Spartans were as religious as anyone. Their praise of the gods, their acceptance and belief of their mightiness, and their celebration in festivals throughout the year highlights just how revered they were by Sparta. This state of ancient Greece like most took its own view on some of the Gods, Sparta’s love of fighting and physical excellence of course led them to favour some gods more than others, but no god was left appreciated by ancient Sparta.